It is 1842 and Maria Merryweather, a 13-year-old orphan is on her journey to the mysterious Moonacre Manor. There she finds herself in a crumbling house of secrets and mystery in a world caught up in time. Maria discovers that she is the last Moon Princess and she has only until the next full moon to undo the misdeeds of her ancestors and save the Moonacre estate from disappearing forever. Although she is aided by a stable of wonderful characters and magical beasts, it is only by self-sacrifice and perseverance that she will be able to succeed. And of course, with a good pinch of magic, Maria is able to save Moonacre, right the wrongs, reunite lost loves and finally bring peace to the valley. 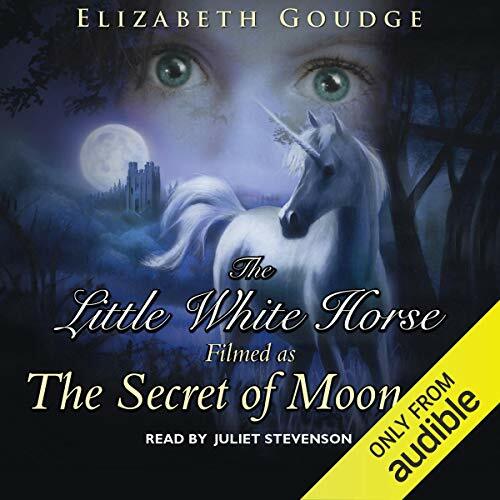 Read by Juliet Stevenson who plays Miss Heliotrope in the 2008 movie based on the book The Secret of Moonacre. ©1946 Gerald Kealey (P)2014 Audible, Inc.
What a pity that this book is short on content and form. I remember it being read to me, when I was 10, and it literally enchanted me! Every word had meaning and painted a portrait of the persons, their adventures, their surroundings. You could almost see the book. This quality is totally gone, so has the magic. The storyline is followed drudgingly and grudgungly, with omission of all personal talking to,other persons and sometimes themselves. Never boring. It gave cachet, brilliance and humour to the tale told. Indeed a grave mistake. A great pity also of Stevenson's very suitable soft voice. Two birds with clipped wings, the book and the narrator. Thank you so much for having this audiobook in! I have always loved the Little White Horse, and I'm so happy it's available for the blind. The abridgement worked very well.